Let’s face it, there are two kinds of grown-ups on Halloween: Those who skimp on the candy, and those who don’t. 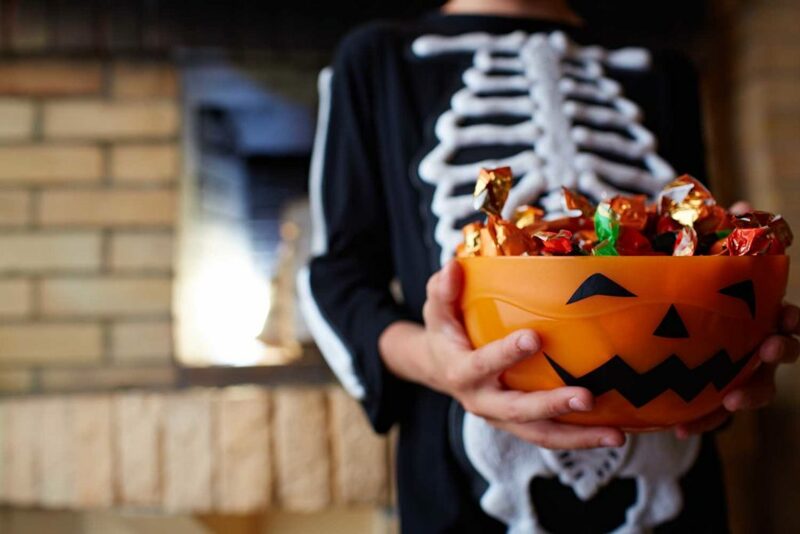 But instead of stocking up on sackfuls of Snickers and M&Ms, trick out your treats with these spooktacular homemade candy recipes. There is a reason candy corn is the red-headed zombie stepchild of Halloween candy: It is awful and literally nobody likes to eat it…unless you make this creamy sugar and butter recipe for homemade candy corn from Food Network. These scratch-made M&Ms are a bit more rustic (read: lumpy) than the classic smooth, symmetrical treats from Mars, but made with a chocolate shell and a sweet peanut and almond centre, don’t expect a bowl of these to last very long at your Halloween party. Most homemade peppermint recipes are for the somewhat simpler peppermint patties or pastries, but this recipe from Taste of Home shows you how to make true hard candy that (it promises) won’t stick to your teeth. They lack the iconic white and red colouring but are packed with vanilla-minty goodness. As ghosts and skeletons are already white, marshmallows are the perfect confection for a Halloween theme dessert. This tutorial shows how to make marshmallows from scratch and use cookie cutters to shape them into fun shapes. The only candy bar better than a thick, chunky Snickers is one you make yourself—which is even thicker and chunkier! This recipe recovered from the author’s old family cookbook is loaded with nutty, chocolaty, marshmallowy goodness. Most DIY versions of the popular chocolate wafer candy are paltry at best, calling for butter crackers or club crackers (puh-lease!). This is a version created through trial and error to actually taste good, using proper desert wafers and milky chocolate. Homemade gummy bears and gummy worms are possibly the simplest items in this list. But try kicking up the Halloween ghoul factor with this recipe for gummy eyeballs. Eat too many and you can literally say that your eyes were too big for your stomach. Like Kit Kat bars, most recipes homemade Reece’s peanut butter cups still can’t top the commercially-produced original for taste and consistency. Part of the problem is that they use pure peanut butter, which as any kid on Halloween will tell you, is nothing compared to the oily, sugary peanut filling from Reece’s. But this version from Big Oven takes it a step further and mixes the peanut butter with powdered sugar to make a cup that is sweet and creamy inside and out. No Halloween would be complete without the sweet, chalky, disks we call Sweet Tarts. This recipe isn’t the simplest on this list (they take a few days to fully set), but with a little patience, you can replicate the sweet, sour, colourful bliss of the time-honoured treat.